Komen San Francisco Bay Area is proud to offer assistance to those struggling with the financial burden of breast cancer treatment through the Komen San Francisco Bay Area Treatment Assistance Program. This program bridges the gap for underserved individuals who are actively undergoing breast cancer treatment. With this program, we aim to help those who are facing financial challenges by providing limited financial assistance, education and support services to low-income, underinsured or uninsured breast cancer patients throughout the Komen San Francisco Bay Area Affilate service area. Financial assistance is available for breast cancer treatment expenses such as oral pain medication, anti-nausea medication, oral chemotherapy/hormone therapy, child care/elder care, transportation to and from treatment, lymphedema care and supplies and durable medical equipment. Funding through this program helps patients of any age who have been diagnosed with breast cancer, at any stage of the disease. Financial assistance is granted to patients who meet predetermined eligibility criteria. To learn more about this program and other helpful resources, call the Komen Breast Care Helpline at 1-877 GO KOMEN (1-877-465-6636). 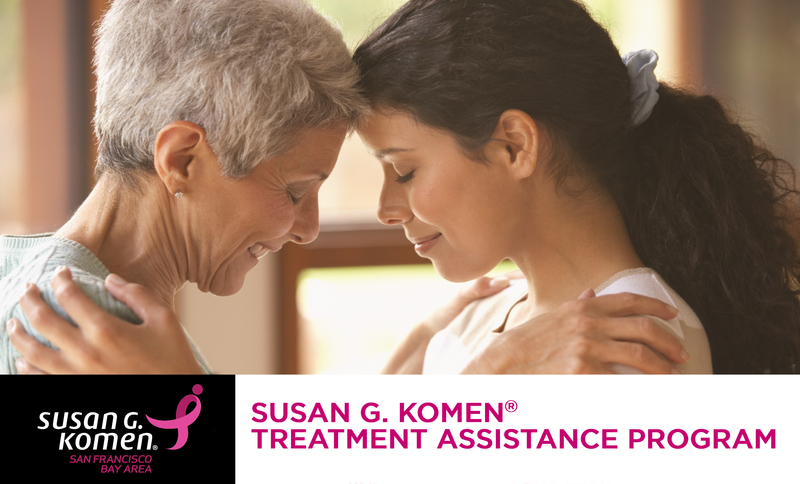 For more information please download the Komen Treatment Assistance Fund Flyer: San Francisco Bay Area ATAP Flyer or visit the Susan G. Komen Financial Assistance Page.